Offering free Wi-Fi this motel is 50 minutesâ?? drive from Havasu National Wildlife Refuge. All rooms are equipped with a cable TV. Free parking is provided on site. 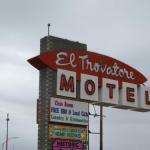 Each air-conditioned room features a private entrance a microwave and a small refrigerator at El Trovatore Motel Kingman. An en suite bathroom is also included. Guests can take advantage of barbecue facilities at Kingman El Trovatore Motel. Laundry facilities and a vending machine are also available. Mount Tipton Wilderness Area is 55 minutesâ?? drive from the motel.